(21412.M112.5, Z. P. Meyers/Barney Hillerman Photographic Collection, OHS). In July 1973 the Oklahoma State Prison at McAlester erupted into one of the worst prison riots in U.S. history. Crowded conditions that led to the riot had been in place almost since the facility's construction in 1911. 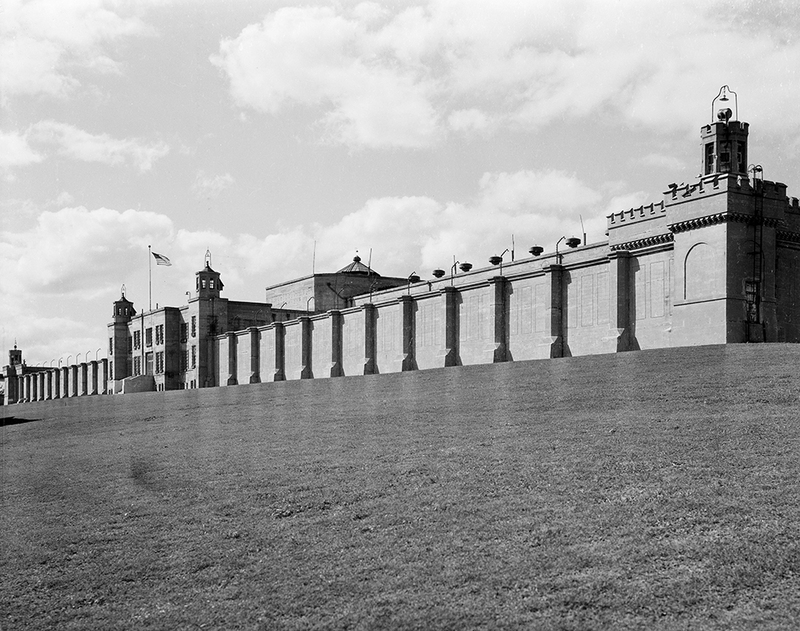 Housing capacity for eleven hundred inmates was surpassed in 1920, and by 1973 the prison population exceeded twenty-two hundred. Gov. David Hall's refusal to sign parole recommendations for drug offenders and individuals convicted of violent crimes had contributed to prison overcrowding. Poorly trained correctional officers, violence perpetrated by the "convict bosses," and other factors also led to prisoners' discontent. On Friday, July 27, 1973, the prison exploded into violence. Around 2:30 p.m. inmates in the mess hall stabbed Capt. C. C. Smith and Lt. Thomas Payne, who were later treated at a hospital. Prison official Jack Hall and Deputy Warden Sam Johnston both attempted to help but were attacked by eleven or twelve inmates and taken as the first hostages. Approximately twenty-one prison officials were held hostage. At 4:30 p.m. the first of three inmate deaths occurred when Elwoodrow Lee Brooks was stabbed and beaten to death by fellow prisoners. By 5:35 p.m. the inmates had seized the hospital; twenty-five minutes later the prison was ablaze. Among the demands the inmates made for the release of hostages were total amnesty for the ringleaders of the riot, media coverage, and access to U.S. Justice Department and American Civil Liberties Union attorneys. On July 28 at 12:30 p.m. inmates released the hostages but retained control of the prison until August 4. The riot caused more than $20 million in damage to twenty-four buildings, and the state considered closing the prison. A Special Task Force Committee on Penal Institutions convened from August 7 to September 21, 1973, to determine the fate of the McAlester prison and the penal system in Oklahoma. The committee determined that the Oklahoma State Prison should function only as a maximum-security prison for three hundred to five hundred prisoners and that personnel quality should be improved by in-service training and higher salaries. Unfortunately, these provisions were never fully implemented and thus did little to solve the problems. In March 1974 inmate Bobby Battle, an African American, won a lawsuit against Warden Park J. Anderson and the Oklahoma Department of Corrections for alleged cruelty and discrimination. U.S. District Court Judge Luther Bohanon ruled in favor of Battle and subsequently handed down a written opinion listing forty-three orders to corrections officials concerning minimum standards for the prisoners' medical care, housing, and safety. Despite changes in prison conditions, another riot occurred at the Oklahoma State Prison in December 1985. Daily Oklahoman (Oklahoma City), 1 August 1973. Clyta Foster Harris, "A History of the Oklahoma Prison System, 1967–1983" (Ph.D. diss., University of Oklahoma, 1985). McAlester (Oklahoma) News-Capital, 5 August 1973. "McAlester Prison Riot," Vertical File, Research Division, Oklahoma Historical Society, Oklahoma City. Harijit S. Sandhu, History of Corrections in Oklahoma, 1908–1988 (Stillwater: Oklahoma State University, 1991). Tulsa (Oklahoma) Tribune, 16 March 1974. Les Brooks, "McAlester Prison Riot," The Encyclopedia of Oklahoma History and Culture, https://www.okhistory.org/publications/enc/entry.php?entry=MC002.